Beachy Head rises above the clouds. The image has several strengths — from the wonderful warm light, the precarious vantage point, and the presence of sea mist which, to the uninitiated, almost look like clouds. But what really completes the photo are the men silhouetted in the far end of the cliff. It gives the viewer a sense of scale of the majestic landscape that is Beachy Head. THis is a wonderful picture. Check out pictures of Roraima or The Abyss is La Gran Sabana for more end of the world pictures. 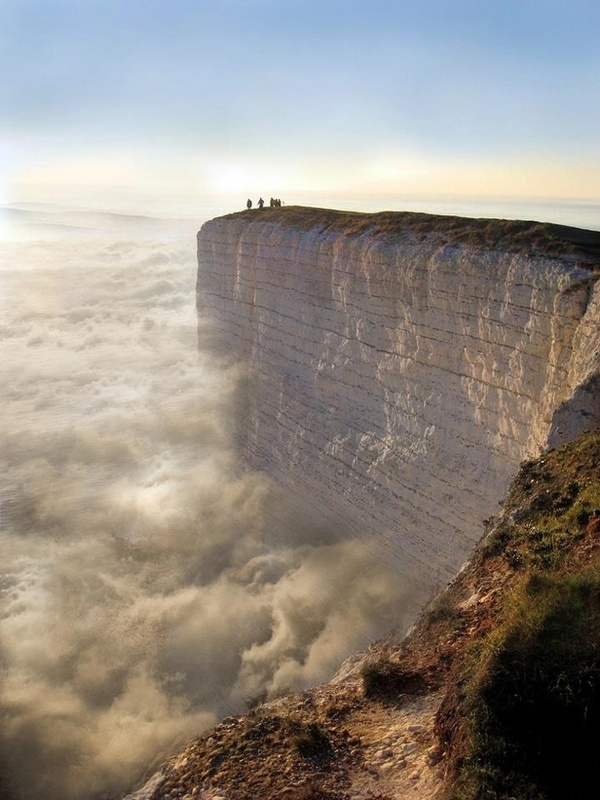 I live in Eastbourne and whilst this is a chalk cliff I have never seen “Beachy Head” like this. Are you sure this is “Beachy Head” or has the phot been manipulated?